No adventure is too great for this go kart! Inaccessible pathways and rough terrain are no problem for the sturdy off-road tyres. With a heart set on adventure there’s no limit to the fun (and mud!) a child can get into. Fortunately this kart is equipped with mudguards to limit the splash factor. 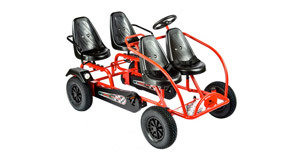 The X-Cross is the high-end pedal-powered kart of your dreams! 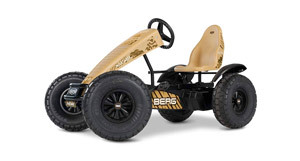 Steer the wheel with just one finger, and navigate smoothly through difficult terrain with the swing axle construction. 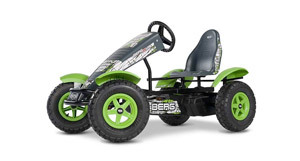 This is the ultimate ride your child will love. Quiet and impeccably camouflaged, just the ticket for a wildlife safari in Margam Park! Large inflatable wheels are made for off-road environments, and the swing axle helps you steer even in the face of rough terrain. 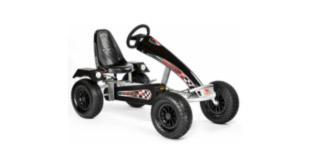 What will you spot on your Go Kart Safari? How long have you been dreaming about a real racing car? Everyone will look at you in this cool Dino Kart Dragster; if they get the chance, because you will soon be tearing off again! Thanks to the pneumatic tyres and aerodynamic spoiler, you are guaranteed high speeds! 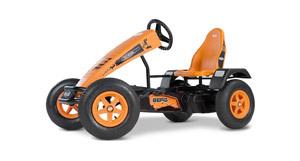 It’s a new revolution with our Berg Revolution Go Kart. Unparalleled quality with jeep’s stamp of approval for this off road demon, fitted with front spoiler for extra speed and control, back mudguard to prevent splatter and huge 40cm tyres for extreme off-roading in Margam Park. This great fun packed Dino Family Train pedal go-kart has been designed and built so that whole family can have fun and exciting times together. Have fun by sharing the pedalling in the back two seats while two small children can sit up front and enjoy the ride through Margam Park. 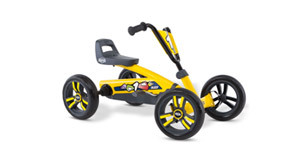 Get your first pedal experience on a BERG Buzzy Yellow. This super cool yellow sensation on four wheels is much sturdier than a three-wheeler. Your feet remain firmly on the pedals even round sharp corners. 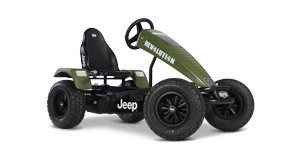 The seat and steering wheel are adjustable for years of pleasure on your new four-wheeler!